Our dogs are our best friends, and adventures are always better when spent with friends. 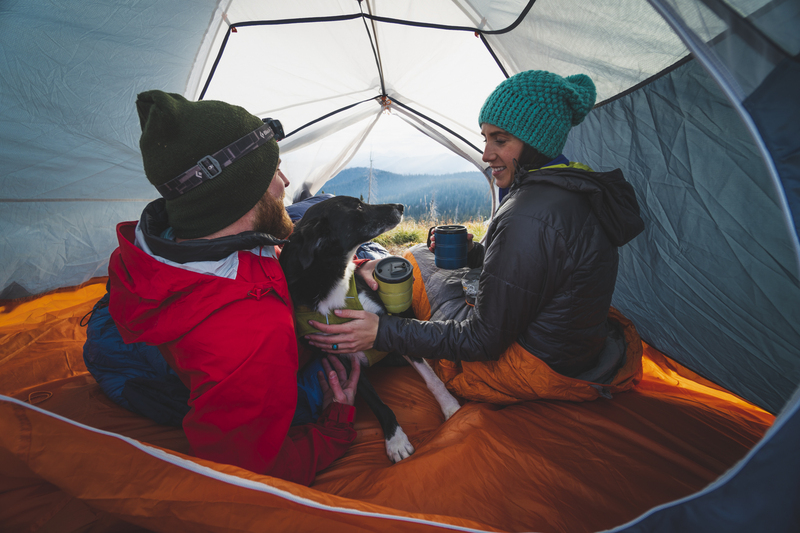 Dogs keep you company, make you feel protected, and keep the tent a little warmer on chilly nights. But without the proper preparation (mentally and logistically), taking your dog camping with you can be a nightmare. You don't have to leave your pup at home on your next camping trip, but you do have to do a little planning and practice. Here's how to bring your furry friend along without any meltdowns. Not all campsites are created equal - many restrict access or ban dogs completely. National park rules vary by park, and state and local parks can have drastically different rules. Avoid getting turned around or even fined by planning ahead, finding dog-friendly areas, and following the rules specific to each recreation area. Dog toenails can wreak havoc on ultralight tent floors and mesh. Lay down a tarp on the floor of your tent and keep your dog off sleeping bags and pads as much as possible. Consider bringing your less-than-top-notch gear on the first few trips with your dogs in case rips and tears occur (as they often do). While you're dog tired after a long hike, your dog might not be. Adventurous days with new smells and creatures can make it hard for dogs to settle down for bed. Make your pup a designated sleeping area in your tent, whether it be a blanket, dog bed, puppy sleeping bag, or an area between mattresses. Bring a small toy if your pup often sleeps with one and try to follow your home nighttime routine to make the bedtime experience more familiar. To many dogs, sleeping in a zipped up tent can be stressful. Before you haul your pup into the wilderness and expect them to snuggle into a sleeping bag, try it out in the comfort of your own home. Make your dog familiar with the tent with the door open, then let them relax before zipping them in. There's nothing worse than a panicked dog ripping a retriever sized hole in your tent mesh during a multi-day trip, so familiarize your pup with their sleeping conditions beforehand. Bringing your dog along requires some extra weight. Make sure you bring plenty of water, dog food, and a bowl or two. Dog food has a very strong smell, so keep it out of your tent and sleeping area as you would human food. You can even have your dog carry some of their weight with an outdoor dog pack - just make sure they practice wearing it around a little before you hit the trail. Yes, Leave No Trace applies to your dog, too. Keep the poo out of the woods and bring along waste bags to pack in and out. Bring a large zipper bag (or two) to collect the baggies along your trip and to help lock away the smell. Some dogs have enough energy in the day to summit Everest, but others don't. Make sure you know your dog's activity level and plan your trip accordingly. Are they great rock scramblers or do they prefer to stick to dirt trails? Some younger or smaller dogs may need a nap break mid-trip to recharge, so plan some break times and pay attention to when your dog needs a snooze. We have the privilege of bringing our dogs to many outdoor recreational spaces, but bad behavior can get those privileges taken away. Respect leash laws if they are in place and consider keeping your dog on leash even if it's not a requirement - to keep wildlife, visitors, and your dog safe and relaxed. Camping with dogs can be fun and easy with a few easy tricks so you'll never want to leave your pup at home again.